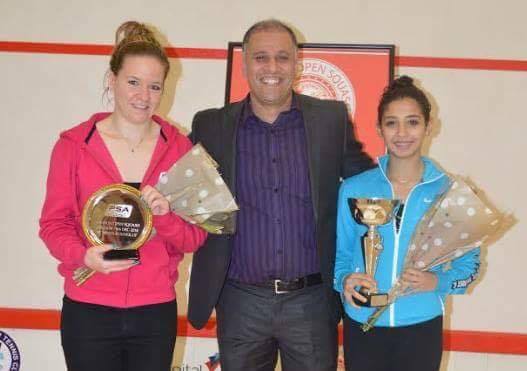 Egypt’s Nada Abbas won the 2016 London Squash Open, which came to an end on 4 December. Abbas defeated England’s Julianne Courtice in the final match with a score of 3-2 (8/11, 11/4, 11/7, 12/14, 11/6). The victory comes one day after the Egyptian women’s squash national team won the 2016 Women’s World Team Squash Championship. In the 2016 London Squash Open’s first round, Abbas defeated Czech Eva Fertekova, with a score of 3-0 (11-5,11-6,11-3). In the quarterfinals, Abbas beat Belgium’s Tinne Gilis in a match that ended 3-1 (11-4, 5-11, 11-9, 11-5), before winning against Czech Anna Serme in the semifinals with a score of 3-0 (11-8, 11-5, 11-6).